In 1994, a nationwide TV News stir took over the airwaves featuring a cancer riddled teenage runaway with parents pleading for his return. 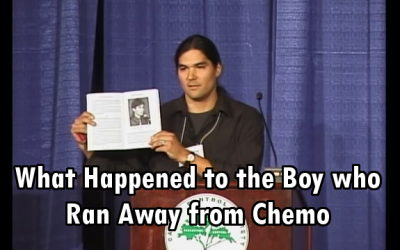 The runaway’s name was Billy Best, and he returned home on one condition: No chemo! He and his parents went alternative. Now, he is very healthy and cancer-free, back home working in a local health food store, consulting parents of children who are pushed into chemo and participating in medical school seminars on patient choice. He continues to be interviewed by alternative news sites whenever a story breaks on families having to become fugitives for refusing chemo and radiation on their children. He and his mom have a site, too, which can be found here. Now, he also has a book out, as told to writer Linda Conti. It’s called The Billy Best Story: Beating Cancer with Alternative Medicine, and it has mostly five-star rave reviews on Amazon. From the bits and pieces of media coverage since the time Billy ran off, one gets the impression that Billy wound up in California. And from there he discovered cancer-healing protocols for his Hodgkin’s lymphoma. But actually, he never reached California. That was his Greyhound bus destination originally, but he wound up in Houston, TX. Instead of roaming the streets as many run-away teens do, he was fortunate enough to meet up with fellow skateboarders who helped house him. Billy had no idea of there was a nationwide hunt for his return. His parents had contacted several national news outlets out of concern for his whereabouts and health. But one day, the father of one of Billy’s skateboarder buddies said he saw Billy on one of the TV shows featuring his runaway from home after five chemo treatments. So Billy decided to return home with one provision: no chemotherapy. Instead, he would decide on alternative methods. His nationwide exposure had elicited many suggestions from which he could choose. Gaston Naessens had fled France to be able to administer injections of 714X in Quebec, Canada, but soon ran into problems there also. His solution of camphor, nitrogen and mineral salts is still manufactured in Canada, but its use is banned in North America. Billy was taught how to inject it himself in nearby Canada, where he could purchase it and still perform occasional maintenance injections. Like potent hemp or cannabis oil, 714-X is on the Medical Mafia’s no-no list and is difficult to get and administer. Another integral part of Billy’s recovery lied with Essiac tea – a powerful tea that has treated thousands of cancer patients. As long as it’s not promoted as a cure, Essiac tea is very inexpensive and widely available. The trick is getting the highest quality herbs and making your own tea. Reports of cancer patients not benefiting from Essiac tea are usually because they used prepared teas purchased off the shelves of health food stores, which ironically are also more expensive than buying the herbs and making it yourself. But Canadian nurse Rene Caisse cured thousands with the tea from her small-town clinic. After she died, authorities raided her clinic and destroyed all the records they could find. But the tea’s recipe was discovered by Dr. Gary Glum, D.C., through one of Rene’s former associates. Unfortunately, few providers understand the importance of having the exact, fresh organic herbs that Caisse used. Cheating even a little corrupts this tea too much. It’s my experience that you can be assured of the highest quality herbs and instructions for making the tea here (http://renecaissetea.com). My Brother was given 14 months to live when the Doctor finds out that his body cannot take Chemo anymore. ever since then, the family have been in pain knowing that they where going to loose a precious son that was just 23 years old to Cancer of the lungs. my mother did a lot of research when she found out that cannabis oil was the cure all medication for cancerous diseases, that was highly guaranteed to cure all cancers and other various diseases. my mother bought the Hemp oil for my brother and he has just completed his treatment 3 weeks back. his latest test result indicated that his cancer has been gone without a single trace in his system. Thanks to Rick Dr Thomas where the Hemp oil was purchase. For all those suffering from cancer and other various diseases with no where left to go, contact Dr Thomas at: [email protected] purchase your cannabis oil. My Mother in law was diagnosed with breast cancer and she was at the point of death, with cancer of the Breast in it final stage is now back alive and she is so healthy now. Thanks to Rick Simpson for the cannabis oil that we bought. the Hemp oil was successfully used in curing my mother in-law breast cancer within 3 months as stated in phoenix tear. Once again i want to thank Rick for his wonderful Hemp Oil we are now happy family with my mother in-law back alive, strong and healthy. MY daughter’s friend who had leukemia when he was young, he did have chemo. Today his stomach was destroyed… infertility, lots of problems today. his bones are dissolving and braking -had many surgeries to ‘fix them’… when he was young, he had stage 4 doctors gave him 2 months to live. his uncle (who is a scientist and botanist gave him turkey tail mushrooms and some wild herbs… this man survived the cancer. He was the only who who survived in the children hospital . He was lucky Still he has lots of health problems due to the chemo.